The tropical rainforests of the East Maui Watershed support some of the most pristine native ecosystems on the Hawaiian Islands. 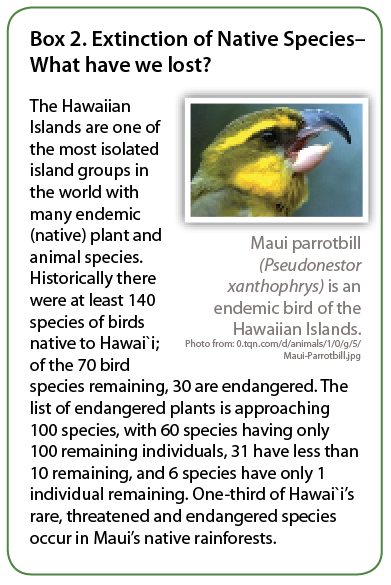 The area provides critical habitat for rare and endangered birds including the Maui parrotbill (Pseudonestor xanthophrys) and crested honeycreeper (Palmeria dolei), and hundreds of endemic flowering plants and ferns. Although these rainforests are biologically diverse, the introduction of non-native plants, such as miconia (Miconia calvescens DC), threaten to disrupt the watershed’s ecological balance and services critical to the viability of the island. Miconia calvescens is native to Central and South America. In the early 19th century the plant was revered by horticulturalists as “a jewel of the plant kingdom” leading to its introduction to botanical gardens throughout the world. Today, miconia is one of the most highly invasive and ecologically destructive plants in the Pacific Islands. “The first miconia introduction to the Hawaiian Islands was a single tree planted in 1961 at Wahiawa Botanical Garden on the island of O'ahu,” explains Jeremy Gooding, liaison for the National Park Service Pacific Islands Exotic Plant Management Team (EPMT) and lead for the miconia project on Maui. “This was followed by ornamental plantings of miconia on the island of Hawai'i by 1964, Maui by the late 1960s or early 1970s, and Kaua'i by early 1980.” In 1988, miconia was first reported to have escaped cultivation from a nursery in Hana, Maui. 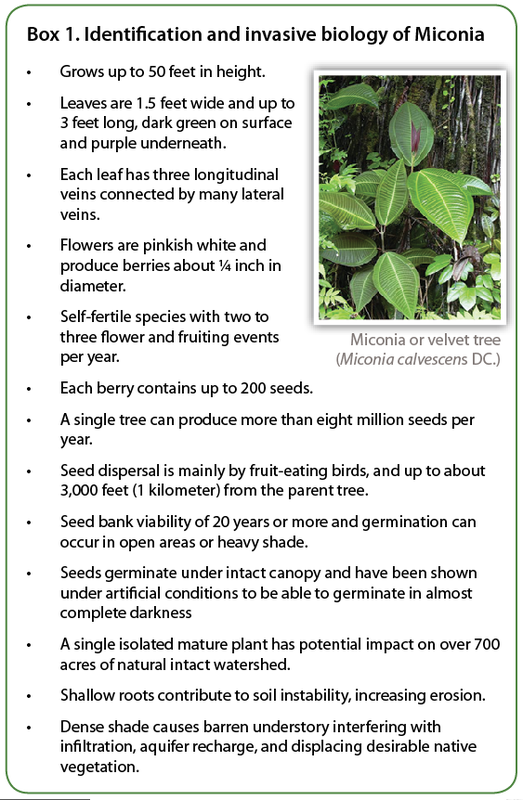 Today there are over 2,000 acres of dense miconia populations surrounding this point of introduction, and another 17,000 acres invaded by small isolated populations of miconia across the East Maui watershed. This represents about nine percent of habitat suitable for miconia invasion, and is a challenge for managers prioritizing limited resources to such a large problem. INITIAL MICONIA ERADICATION EFFORTS began on Maui in 1991 with over 20,000 plants removed within a two-year period. The Melastone Action Committee (now known as Maui Invasive Species Committee) led the work with help from volunteers. By 1993, the committee realized that miconia infestations were much larger, leading to mobilization of private and public partners. According to Gooding, the National Park Service joined forces with the Maui Invasive Species Committee, and other private, county, state and federal partners in 2001 to improve coordination, increase funding, and develop a comprehensive program to contain and control miconia on Maui. This resulted in a merger of crews under a unified command and expanded aerial and ground operations five-fold by 2003. Figure 1. Distribution map of miconia infestations on Maui. Currently there are more than 2,000 densely infested acres and 17,000 acres with light to moderate infestations. A large majority of the East and West Maui Watersheds totally 164,000 acres are prone to miconia invasion. Image courtesy of Brooke Mahnken. Figure 2. Aerial and ground management units are defined by elevation, topography and miconia density. Image courtesy of Brooke Mahnken. The current program focuses on containing miconia and gradually reducing the core infestation. Activities include surveillance, detection and treatment of miconia outside of the high-density infestations, and regular monitoring and evaluation of outlying infestations. Management units define ground and aerial operations to ensure thorough systematic coverage of an area and to evaluate progress of the containment and control effort. A large part of the program includes revisiting infested areas to find and control miconia and prevent seed production. Each operation is recorded with Global Position System (GPS) tracking and integrated into a Geographic Information System (GIS) database, which is used in scheduling treatment operations and monitoring progress. Repetitive searching of high-risk areas for newly invading plants is critical to the success of the containment effort. Management methods include prevention, physical removal, and herbicide application with spray ball, ballistic technology, and ground crews. Most of the reconnaissance and surveillance operations are conducted through aerial operations. Figure 3. The spray ball platform (top) includes a 36-gallon tank, 80-foot line and 3-nozzle arrangement on the ball. Photos by C. Duncan. In the early 1980s, a customized long-line herbicide sprayer was built for the US Drug Enforcement Agency to make directed treatment applications from a helicopter platform. The long-line “sprayball” applicator consists of a 36-gallon tank attached to the release hook on the underside of the aircraft with an 80-foot long line and a 70-pound metal ball-shaped housing (for stability). A helicopter spray ball operation includes the pilot and a spotter. The spotter helps watch for hazards, locates miconia infestations, and records data with a GPS unit including search patterns, and the number, location, and age (mature or immature) of miconia plants treated. Figure 4. Observer Jeremy Gooding records treatment location during application with spray ball platform. Photo by C. Duncan. “We use the spray ball to apply Garlon® 4 Ultra herbicide on larger infestations of miconia closer to the core and on mature trees,” explains Gooding. 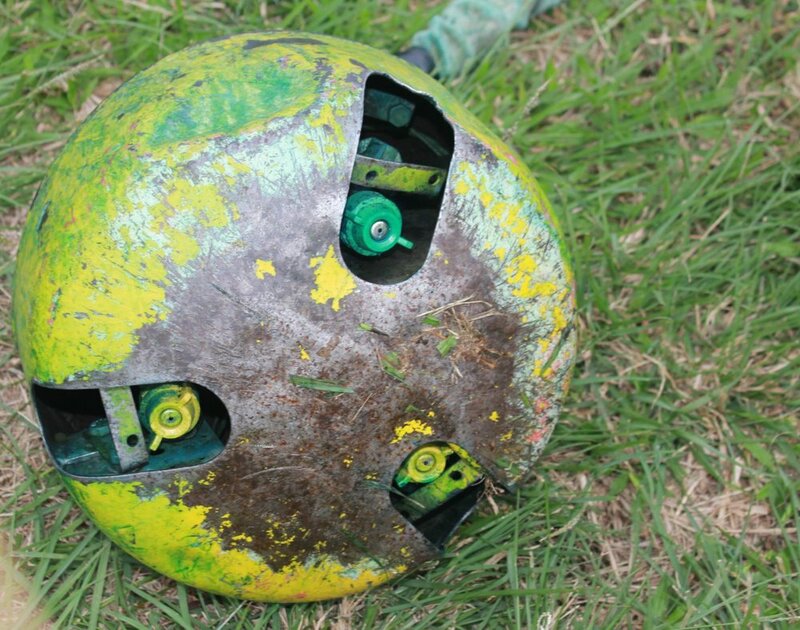 “The spray ball pattern is a spot treatment to minimize non-target damage, and can efficiently treat large individual miconia plants.” The sprayball is a highly effective tool, but has limited application when searching for satellite miconia targets in remote areas. For example, many satellite miconia populations are found in ravines and drainages with individual plants colonizing steep cliff faces. The spray ball can only make effective treatments while hovering vertically over the target. In addition, it is difficult to conduct low altitude surveillance operations with an 80-foot line attached to the aircraft, so two flight operations are necessary -- one to survey and find miconia, and the second flight to treat target plants. These limitations with the spray ball application led to a search for more efficient application methods for satellite miconia populations. Dr. James Leary, Invasive Weed Management Extension Specialist with the College of Tropical Agriculture and Human Resources of the University of Hawaii, joined the miconia control partnership in 2009. “Our task was to help improve surveillance, detection and control efficiency over large areas and difficult terrain,” explains Leary. “Survey time with a helicopter is expensive, and we recognized that if we could survey, detect, and treat individual targets in one operation it would double the value of our flight time.” To realize this concept the partners needed a new, portable application technology that could fit in a Hughes 500 helicopter and the capability to treat both horizontal and vertical cliff side plant targets. Figure 5. Dr. James Leary shows capsules filled with Garlon® 4 Ultra herbicide for use with HBT platform. Photo by C. Duncan. The development of Herbicide Ballistic Technology (HBT) began through a partnership with Nelson Paint Company (the inventor of paintballs), and grew to include Wilbur Ellis Company and Dow AgroSciences LLC to develop a customized projectile for treating miconia. This led to the establishment of an EPA section 24c Special Local Needs registration in Hawaii for HBT-G4U200 with Garlon 4 Ultra. Garlon 4 Ultra proved to be highly compatible with the gelatin encapsulation process, unlike water-based herbicides that can compromise the integrity of the capsule. The HBT-G4U200 projectiles are high quality round ballistics with a thirty-meter effective range and sub-meter accuracy. With the support of the US Forest Service, Special Technology Development Program, full-scale HBT operations, dubbed Operation Hot Mic, began in 2012 under the new registration that is effective until 2017. Figure 6. HBT applicator Dr. James Leary in position behind pilot prior to takeoff for surveillance mission. Photo by C. Duncan. Figure 7. HBT applicator Brooke Mahnken applies herbicide to miconia. HBT allows for fast, long-range, accurate treatment of miconia from a helicopter. Photo by C. Duncan. Figure 8. Miconia often grows on steep canyon walls where conventional treatment methods are impossible. HBT proves to be an excellent platform for treating these remote populations. Photo by C. Duncan. Encapsulated HBT projectiles are ready-to-use. Eliminates the need for handling and mixing liquid pesticides in the field. Eliminates water requirements needed in foliar weed management applications. Excellent precision from either vertical or horizontal trajectories. Able to treat populations growing in steep, inaccessible terrain. Reduces pilot fatigue by diverting application responsibilities to the HBT applicator. Allows for ‘destructive’ monitoring (locate and treat plants in one operation) reducing flight time and fuel costs. Best suited to areas with low miconia density where removal of a plant or small population has a high protection value. Leary compares the miconia project on Maui to a military strategy known as ISTAR: Intelligence (gathering historical plant data, biological information, and other pertinent data); Surveillance (frequent monitoring of areas with good intelligence); Target Acquisition (finding and treating the target plant); and Reconnaissance (expanded monitoring into areas with little to no intelligence). “Using the HBT platform under the ISTAR framework has increased our performance and ability to prioritize resources to the highest value miconia targets,” Leary says. Data collected from this project shows that during the first aerial search of an area, about 60 percent of the target miconia plants are detected, but searching the area once per month over six month increases the search efficiency to more than 90 percent. “It is important for invasive plant managers to understand that you are not going to find all the plants in one survey mission when you are working in dense vegetation and difficult terrain,” explains Leary. Targeting new populations and minimizing or eliminating spread by mature miconia will ultimately exhaust soil seed bank reserves. Ground crew operations provide more effective control in accessible areas, mainly within the core infestation and other sites with high miconia density. They also control miconia near residences and within restricted air space. Although ground crews cover less area than aerial survey operations, they are more effective at finding miconia seedlings below the canopy. “Ground crews sweep designated management units based on visual separation, with each person able to see half the distance through the plant canopy between adjacent crew members,” explains Gooding. “Once located, smaller miconia plants are hand pulled and larger plants are treated with a thin-line application of Garlon 4 Ultra. When working in the core infestation, strict protocols must be followed for sanitation and decontamination, including dedication of clothing and equipment to these infested areas, in order to prevent miconia seed from being introduced into non-infested sites. Due to current funding constraints, most ground operations now only focus on mature plants for mitigating reproduction and disregard any attempts to completely eliminate the entire population from the area. Figure 9. Efficacy of Garlon 4 Ultra on miconia three weeks following treatment with HBT. The application pattern with HBT is about 3 feet (1 meter) resulting in more desirable plant growth into the area. Photo by C. Duncan. Figure 10. Strict sanitation and decontamination protocols are followed by ground crews to prevent movement of seed from miconia-infested areas. Photo courtesy of Jeremy Gooding. This Partnership expends approximately $1 million per year on miconia related activities; however, an additional $600,000 is needed annually to effectively control the population. Leary and Gooding agree that the goal is to continue to work toward increasing efficiency and strive to contain miconia to the core population. Previous research was unsuccessful in finding biological control agents for miconia, yet partners remain optimistic that biological control will ultimately play a role in managing miconia in the dense core infestation on East Maui. Leary JJK, J Gooding, J Chapman, A Radford, B Mahnken, LJ Cox. 2013. 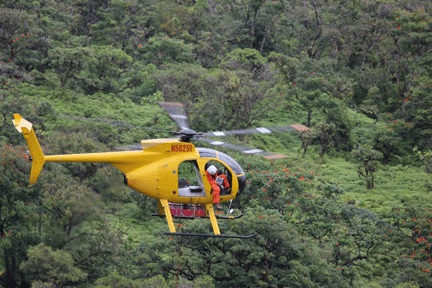 Calibration of an Herbicide Ballistic Technology (HBT) helicopter platform targeting Miconia calvescens DC in Hawaii. Invasive Plant Science and Management. In Press. Doi: http://dx.doi.org/10.1614/IPSM-D012-00026.1. Operational performance of an Herbicide Ballistic Technology (HBT) helicopter platform targeting incipient populations of Miconia (Miconia calvescens) in Hawaiian Watersheds. http://www.cal-ipc.org/symposia/archive/pdf/2012/3_Leary.pdf. For video rendition please visit: http://www.youtube.com/watch?v=988i6SQKSzY. Calibrating the Herbicide Ballistic Technology (HBT) platform for helicopter operations targeting remote populations of Miconia (Miconia calvescens). http://www.ctahr.hawaii.edu/LittonC/PDFs/301_WeedScience.pdf. ® Trademark of Dow Chemical Company ("Dow") or an affiliated company of Dow. State restrictions on the sale and use of Garlon 4 Ultra apply. Consult the label before purchase or use for full details. Always read and follow label instructions.